The team was wonderful. We received a phone call after check in to make sure everything was okay and to let us know about additional promotions. What limited interaction we had with the staff was pleasant and knowledgable. Everyone was friendly, and so so helpful! Couldn't have asked for a better experience. Even on Sunday as we were leaving and we could't figure out the lock box, there was someone available, and more than willing to help us! Leaving our pets at home with a sitter was made so much easier due to the staff of Great Smoky Cabin Rentals. They supplied their office number and the cabin's phone number prior to us leaving our home so our sitter could contact us if needed. 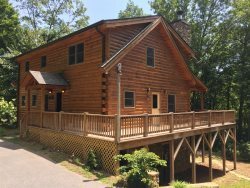 The staff of Great Smoky Mountain Rentals gave us ease of mind. Spending Thanksgiving outside of our or a family members home was a first for us. What a joy it was to spend it in a beautiful and fully furnished cabin outside of Bryson City. We couldn't have been happier with the accommodations. Thank you Great Smoky Cabin Rentals for giving us a memorial holiday. We will definitely be calling upon you again! Since this was the first time we stayed in a cabin in NC, it was the cabin that brought us initially to GSCR. But since our experience with GSCR was so wonderful, in the future we will always check their site first. Excellent service and prompt response to questions . Thank you for giving us a chance to share this piece of Heaven on our trip. We never expected this kind of view and a beautiful cabin we will be back for sure. I wanted to Thank you all so much for such a lovely stay we had at Big Oaks Cabin!! My grandson absolutely Loved it!! So nice & secluded but yet close to everything we needed to go do. Polar express. Bryson City is my favorite place to visit & hopefully I'll be visiting more as I may like to relocate to there. Mike, your maintenance man was very, very nice & helpful for local information. You ladies in the office were excellent!! I felt so at home! We were so sad when we had to leave. I will be recommending you to everyone I see & I thank you from the bottom of my Heart for your help in making our stay memorable. We really enjoyed your beautiful cabin. The view of the mountains in the mornings while sitting in the rocking chairs, sipping coffee was absolutely breathtaking!! Our trip was mainly for the kids. We took them on the polar Express Train Ride. Than you so much for such a well kept and very clean cabin. We will treasure these memories for years to come. Thank you for opening your beautiful home for our vacation weekend. Our family was here for the Polar Express and Christmas parade. We hope to return soon for another wonderful stay. Thank you. We had an absolutely wonderful time at Bear Hug!. The view is spectacular and the hot tub is just perfect! We hiked and shopped. Two days was just not enough, we are already planning our next trip back! Our family enjoyed this trip so much. It was our Christmas Memories. Thank you so much. Beautiful place, had everything that we needed. Very nice!! Was the best experience in my life! Biltmore Estate! Great smoky mountains railroad! Snow! Very calm and silent ! Everyone has always been so polite, kind and friendly. It is a pleasure to call and make a reservation with your staff. We have always been extremely pleased with our stay in your cabins. We highly recommend the properties you offer in your rentals to our friends and family. Your company seemed to offer the most variety and the nicest properties available for rental in the areas we were interested in staying.